Insomniac Games' Xbox One exclusive hits this fall. If you needed another reason to love Sunset Overdrive, here's one: it just made a joke about 90% of the other shooters on the gaming landscape. 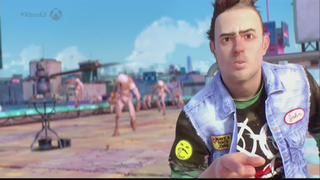 A promo clip at the beginning of Sunset Overdrive's spotlight at the Xbox press conference featured a soldier huddled beind a crate as assailants fired at him. Then a Sunset character blasted in a display of the kind of the over the-top, propulsive gameplay the game's been teasing.